Billy Blue Eye Pottery & Paintings offers a wide selection of gifts from Stocking Stuffers to Hostess Gifts to Exquisite Collectible Fine Art Pottery. 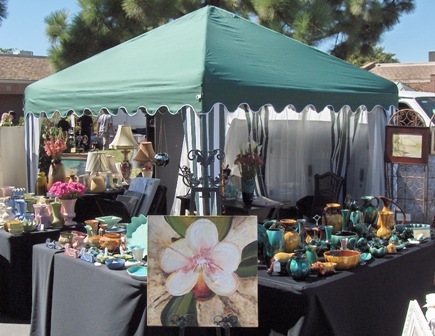 You can find us this Sunday, December 20th at the Long Beach Antique & Collectible Market. It is located at the Long Beach Veteran’s Stadium, Conant Street, just East of Lakewood Boulevard. Find us in the green and white tent in booth A-853. The hours are from 6:30 AM to 2:00 PM and admission is $5.00. For more information contact us at BillyBlueEye@cox.net. I just reviewed your wonderful web site pictures, which were “eye candy” and I hope to visit you in the near future as I am still standing, having moved and trying to find stuff my wonderful family helped me box, which is good news/bad news all at once! So, now I am in Costa Mesa with a new email, as listed below, and you might not remember me, but I remember you and your great personality. I have a personally pleasing collection of wall pockets and (yet another project) looking forward to getting them once again on the walls, but looking forward to attending Long Beach market!